Official Visit of the Chief of Navy of France to the Naval Base "Evangelos Florakis"
On April 8th, the Chief of Navy of France, Admiral Christophe PRAZUCK, paid an official visit at Naval Base “Evangelos Florakis” at Mari, where he was welcomed by the Commander of Navy Captain Charalampos Charalampous. 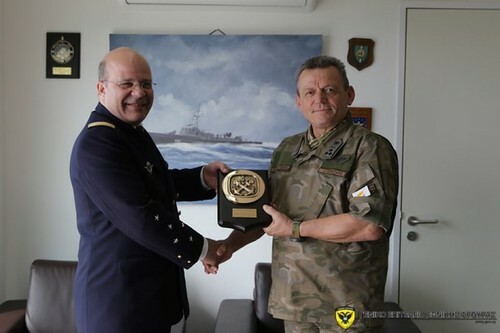 During his visit, Admiral PRAZUCK was briefed about the work and the mission of National Guard and especially about the capabilities and activities of Republic of Cyprus’ Navy, as well as the future actions and goals. In the frame of the visit, Admiral Prazuck met the Chief of National Guard Lieutenant General Ilias Leontaris, and while confirming the excellent relationship between the Armed Forces of both countries, they discussed bilateral issues and developments in the area of Eastern Mediterranean, with special reports on the important role of the Republic of Cyprus as Member State of European Union, being a stability pillar and a reliable partner of France.